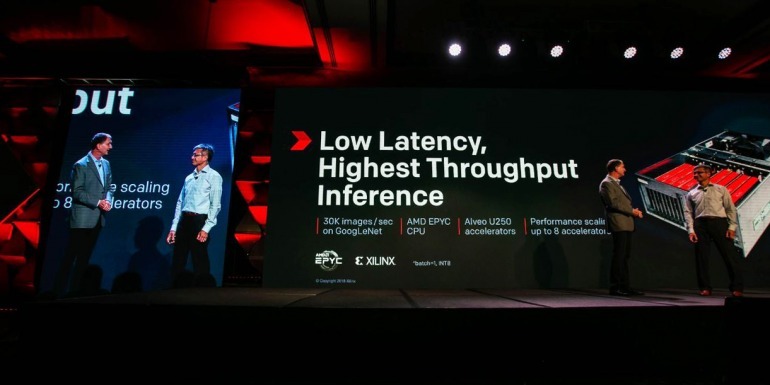 Yesterday at the Xilinx Developer Forum, Xilinx CEO Victor Peng and AMD CTO Mark Papermaster revealed a special moment, a new world-record for inference throughput.30,000 images per-second! This was done on a system using two AMD EPYC 7551 server CPUs along with eight newly announced Xilinx Alveo U250 acceleration cards. The benchmark was performed on GoogLeNet (running a batch size of 1 and Int8 precision), a widely used convolutional neural network. AMD and Xilinx share a common vision around the evolution of computing to heterogeneous system architectures at the event. ZT Systems, known for their work in the hyperscale datacenter space, announced a new system based upon the Microsoft Project Olympus platform. The new system supports AMD EPYC and AMD Radeon Instinct together for outstanding flexibility and performance in virtualized desktop (VDI) environments, or for executing AI and deep learning workloads. You can read more in the ZT Systems press release here and the AMD blog here. Phanteks Enthoo Evolv X Tempered Glass is coming to Singapore!